Throughout my working life, I've had the honor of working with a number of groups of some of the finest people one could ever meet. Currently, however, I work from home 100% of the time and I'm pretty much the only one doing 'what it is that I do'! This allows me quite a decent amount of latitude in my programming efforts, but also makes for a VERY boring work page!! My bosses, Mark Mesenko and Jeff Smith, have heard of my previous 'photo-retouching' exploits...so they refuse to let me have any pictures of them (putting a damper on my April Fool's fun!) 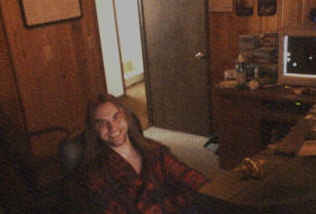 So, all you get nowadays is a lame picture of me in my 'cave' where I have 4 computer monitors staring at me all day! If you are pining to see the old work page I used to have up here, or if you just want to see with whom I used to work, look here.